So I haven't really started working on the deck, although I did buy some fabrics and accessories, and of course, painted the doormat. I love our little deck. It really is tiny (just big enough for a table and a couple chairs), but there's a crab apple tree on one side and along the fence on the opposite side is a row of lilac bushes. It smells amazing out there when everything is in bloom! The furniture on our deck, however, has been slowly collected over the years and that's what it looks like...but not in a good way. I'd like the deck to be a little more inviting...and attractive, so this is my plan for making the not-so-pretty pieces we already have work together to create a relaxing space that we can all enjoy. This creaky, wooden rocking chair we picked up at Ikea a few years back, but I'm working on a new cushion. I'm not in love with the "look at me" blue of the chairs. We bought them on sale at Target last summer and I remember wishing at the time that they had some better colors available. They're still a huge improvement over the hand-me-down plastic chairs we used to have out there. We've been eating out there a lot since the snow melted, but during the day the table is where my tomato plants live. I started them from seed and planted the first few in my herb garden the other day. The rest will go in my raised beds soon! We bought this indoor/outdoor recycled plastic rug when Abe was a baby. It's not my favorite thing ever but it is easy to clean and provides a soft spot to play with a baby. So there you have it. An official "before" post of our little deck, which I'm hoping will look a bit more pulled together the next time I take pictures of it! I love that little table! And I'm thinking of getting an indoor outdoor rug for inside--thinking it will make for easier clean up with all the pets and kids--so your assessment is they're soft enough for crawling knees? that's my main hesitation. It's not very thick so it won't protect from bumps and bruises the way regular carpet can, but if you're keeping it inside you could use a rug pad to make it as cushy as you like. The texture of the rug itself is really smooth - no chance of getting rug burn on little knees! Can't wait to see it come together! I love our lilac hedge too, it smells so amazing when it's in bloom. I'm not a garden expert by any means but I'm trying impatiens for our deep shade in front of the house for a pop of pink. Yeah, I think I'll try impatiens, begonias, and I already bought a fuchsia. I always neglect to feed my plants so my biggest problem will be keeping them in bloom! You have a beautiful deck, Michelle. Is it just the furniture that you're planning on giving an upgrade or do you plan on cleaning and staining the deck itself too? I think it'll be a good idea, not just for the design upgrade but also for the sake of maintenance so you can be sure to enjoy your deck for much longer. That said, I look forward to your final reveal. Thanks for sharing! It's really amazing how colors can make such a huge difference! 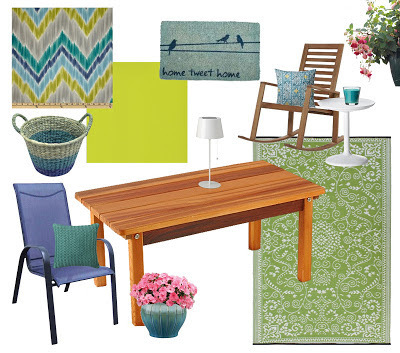 Your deck may be a small, but it is full of colors that can liven up the space even more. Anyway, don't forget to always power wash your deck to keep mold and mildew from growing.